Sushi @ Tsukiji (Kujira Yukke) [whale sushi in Japan],courtesy of Hajime NAKANO. 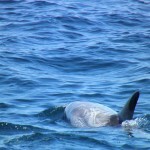 The people who made The Cove, the documentary about Japanese Dolphin slaughter that won an Academy Award Sunday, used some of the same techniques to bust a hipster Santa Monica sushi restaurant for selling whale, the New York Times reports. DNA tests confirmed that a $60 piece of sushi that The Hump sold as whale was in fact the endangered Sei Whale (Balaenoptera borealis). that $60 piece of sushi was sei whale. DNA-testing sushi is now becoming a food investigation mainstay; it’s almost as popular and fun as finding e. coli at food carts. But normally the results are the opposite: the fish is not what the restaurant says. It’s a cheap substitute. In this case it was on the Omakase, or tasting menu, and the wait staff told the undercover diners they were eating whale, sometimes calling it by its Japanese name, kujira. 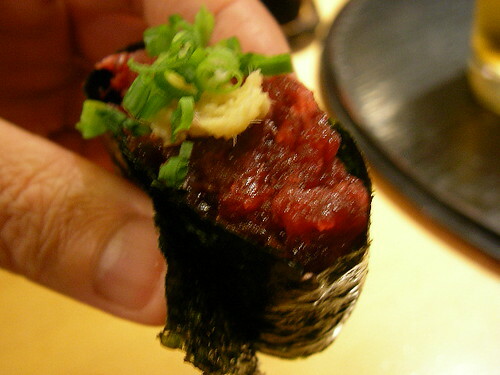 The food blog Shizuokasushi explains how whale is served casually in Japan, though usually sperm whales. Japan hunts about 100 sei whales a year under the guise of “research,” according to the IUCN Red List. Louie Psihoyos, photographer and director of The Cove, worked with “director of clandestine operations” Charles Hambleton, who made tiny cameras for diners to wear–once for themselves and a second time for investigators. An affadavit from investigators describes a search of the restaurant and suggests the whale may have arrived via a Mercedes parked out back. Brown pelicans, just removed from the Endangered Species List three months ago, are getting slammed by California’s polluted storms. These swimming birds can cope with rain far more gracefully than whiny Los Angelenos have been. But the water is so polluted that they have to be treated like oil spill victims. The International Bird Rescue Research Center had 80 pelicans by 7 p.m. Friday and expects they’ll be treating 100 hypothermic birds this weekend. There’s a bit of callous reaction to the brown pelican‘s plight. One comment on the Washington Post site said it was just the “circle of life.” But they aren’t dying because of storms; they’re freezing because the contaminants break down their natural waterproofing and insulation. “Brown pelicans tend to feed and congregate near harbors and river mouths where nutrients from the runoff attract fish and other creatures. 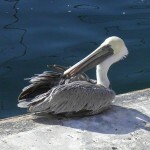 Pelicans can easily become dirty from pollution in these areas and can lose their waterproofing. The current massive runoff from the storms has brought even more grease, car oil sheen, fish oils and other forms of surface pollution into the coastal areas where these birds feed,” says executive director Jay Holcomb in a letter to supporters.